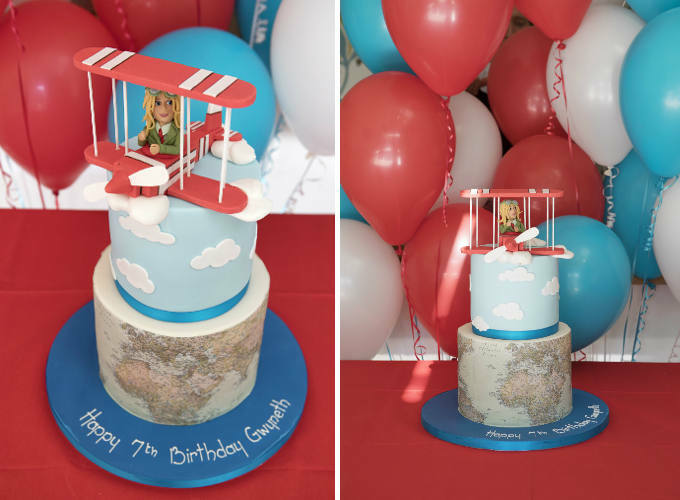 We were delighted when we were asked to create a stunning birthday cake for the daughter of award-winning and internationally renowned photographer Julia Boggio, for her seventh birthday party. Julia gave us the brief for the birthday party, which was being themed around inspirational women in history and she tipped us off that Gwyneth is in awe of the late aviation pioneer, Amelia Earhart, who was the first female aviator to fly solo across the Atlantic. Ideas came thick and fast and we got to work in our cake studio to create a masterpiece in cake form for the delightful little adventurer, Gwyneth. The pressure was on for us to create something extra special. Julia was after all the designated photographer of the party and would be taking snaps of our cake. We requested a picture of Gwyneth and gave the sugar model our best shot and we think we did an amazing job to get her flying high with her head above the clouds. It was tricky getting the map printed onto the icing on the bottom tier, but we love a challenge at the Cakes by Robin cake studio. 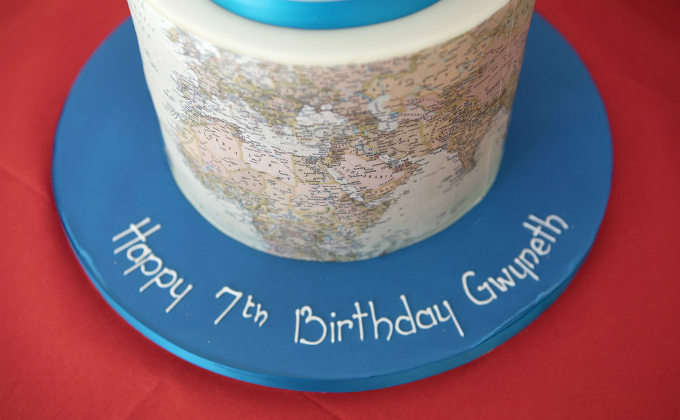 We hope you will agree that we did Gwyneth proud with our ‘on top of the world’ 7th birthday cake celebrating a truly inspirational woman and Julia did an amazing job capturing our cake creation on camera. We were as delighted with the outcome of this cake commission as Gwyneth and proud mum, Julia. 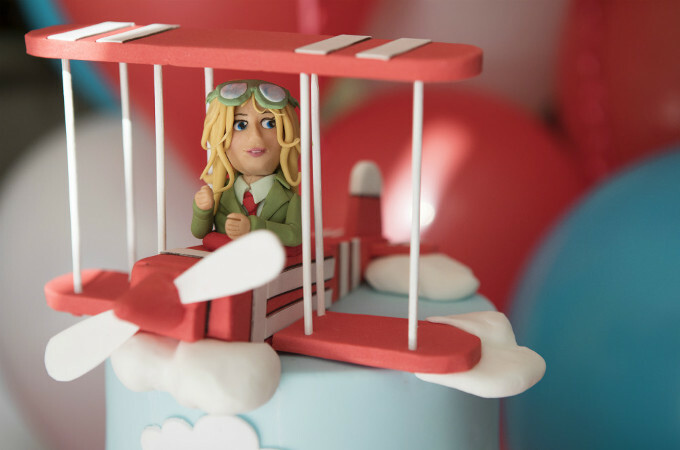 The cake captures Gwyneth’s adventurous nature down to a tee and pays respect to the amazing Amelia Earhart, whose disappearance has puzzled the world for the last 81 years. Gwyneth definitely gets her adventurous nature from her mum. Julia is always breaking boundaries; she has even climbed Mount Kilimanjaro to raise money for charity! All in all, it was a brilliant 7th birthday party enjoyed by all. The chocolate fudge cake went down a treat with Gwyneth and guests, who were all given copies of Bedtime Stories for Rebel girls to take home. We were as delighted with Julia’s photographs as she was with our cake. If you have a little adventurer with a birthday coming up, contact our cake studio to get little dreams captured in cake form. We love to make cakes that inspire little ones to pursue their dreams.